The following is today's devotional reading found in The Word For You Today, a three month devotional booklet that is distributed to the members of First Assembly of God. When George McCluskey started a family, he decided to invest one hour every day in prayer because he wanted his children to follow Christ. Then he expanded his prayers to include his grandchildren and great-grandchildren. Every day between 11:00 a.m. and noon he prayed for the next three generations. As the years went by, his two daughters committed their lives to Christ and married men who went into the ministry. These two couples produced four girls and one boy. Each of the girls married a minister and the boy became a pastor. The first two children born to this generation were both boys. Upon graduation from high school, the two cousins chose the same college and became roommates. During their sophomore year one boy decided to go into the ministry. The other didn't. He undoubtedly felt lots of pressure to continue the family legacy, but he instead chose to go his own way and pursue his interest in psychology. He earned his doctorate and eventually wrote books for parents that became best sellers. Eventually he started a radio program that was heard around the world each day. 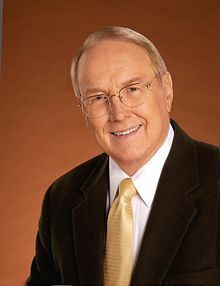 The man's name - James Dobson. So now you know the story of George McCloskey! He was just an ordinary man, but his prayers had an extraordinary effect on much of the world. If you are a parent or a grandparent, the Word for you today is, "Arise, cry out in the night...pour out your heart like water before the face of the Lord. Lift up your hands toward Him for the life of your...children."